One of the very few downsides of ordering PCBs from Seeed Studio's Fusion service is the shipping cost. While an individual PCB can cost less than $0.50 in multiples of 10, shipping to Western Europe can add another $20. One way to amortize these costs is to add more PCBs to an order, either from my own "design pipeline" or by searching online for cool projects. 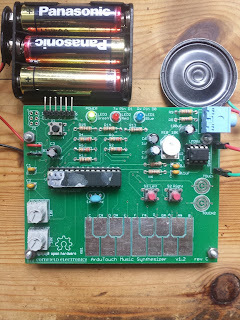 One very cool project discovered in this way, was ArduTouch from Cornfield Electronics. One the hardware side, this is basically a battery-powered Arduino Uno with an LM386 amplifier driving a 4-Ohm mini-speaker, or your HiFi via line-in. The keypad is very nicely integrated into the PCB, see my construction below. Software-wise its GitHub provides five (at the last count!) different synthesizer sketches and a library for constructing your own. As usual, sketches are compiled in the Arduino IDE and uploaded by FTDI cable. A nice touch is that they uploaded a BOM for Mouser, making ordering the parts a snip! I have several PCBs left over from this order. If you want one, contact me through the Tip Jar on the right. However I would encourage you to support the guys who made this great project possible by buying one of their kits.